Today the U.S. Census Bureau reported the January’s retail sale comes at +0.3%, lower than the +0.5% expectation by the market. The retail sale data of December is also revised down to +0.5% from +0.6% reported earlier. In another report, December’s business inventory grows at +0.8%, better than the +0.6% anticipated by the analysts. 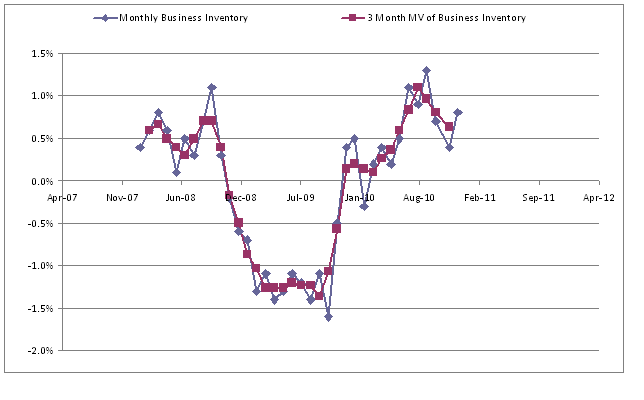 November’s data of business inventory is also marked up to +0.4% from +0.2% initially reported. The worse than expected retail sale data suggest the economy lost steam with slower consumer spending. 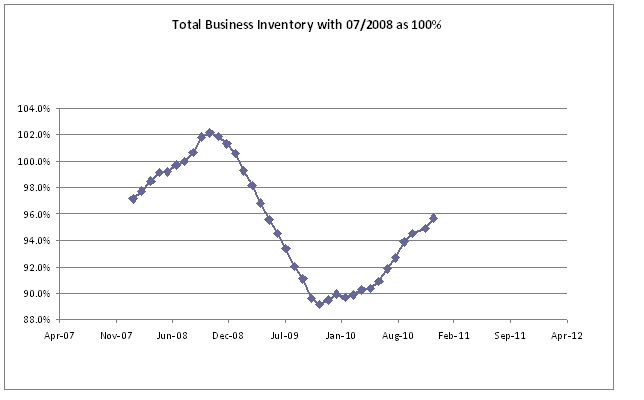 However, the upbeat business inventory is enough to make up the difference caused by the shortfall of retail sale. Overall, the U.S. economy should have a healthy growth in the 1st quarter of 2011 based on the existing data. The market has priced in a at least 4% GDP growth in the Q1/2011. It has not done yet even though it has been in the overbought territory for a time. The daily RSI of Dow 30 is above 70. And Dow 30 keeps on being traded at the price two times of the weekly variation above the 50-day EMA, which typically indicate a two deviation event that suggests overbought and a pullback should be followed soon. But in the point of view of wave, the mood is pretty bullish. The whole structure of the wave count is still not complete until the end of February based on my estimate. So the market should make a new high no later than the first week of March. This entry was posted in Economy, Market and tagged Business Inventory, Dow 30, Elliott Wave, GDP, Hui Zhong, Retail Sale. Bookmark the permalink.